The story of Kongo began about six years ago when he was discovered as a suitcase stowaway during a business trip. (Mrs. Kongo loves to sneak surprises into the luggage). I quickly began taking pictures of the little monkey in different settings and emailing them back to Mrs. Kongo and when granddaughters came along they also began receiving pictures and began tracking the little monkey’s journeys. It’s sort of like a simian version of the traveling gnome which, I believe, was stolen from the movie Amélie. In early November 2011, I had a weird dream about Kongo wanting to start a travel blog but he couldn’t find the right software to do it. Anyway, it got me thinking about a blog for Kongo, I stumbled upon WordPress, and the rest is…well, history. simian with big monkey eyes and a thing for Kongo which poses a few complications as Kongo and Rabbit (see below) were kind of going monkey-steady in a long distance relationship. We’re not sure how all that is going to work out but as it turns out simians are not all that monogamous and we all know about rabbits so Kongo has lots of happy relationships. 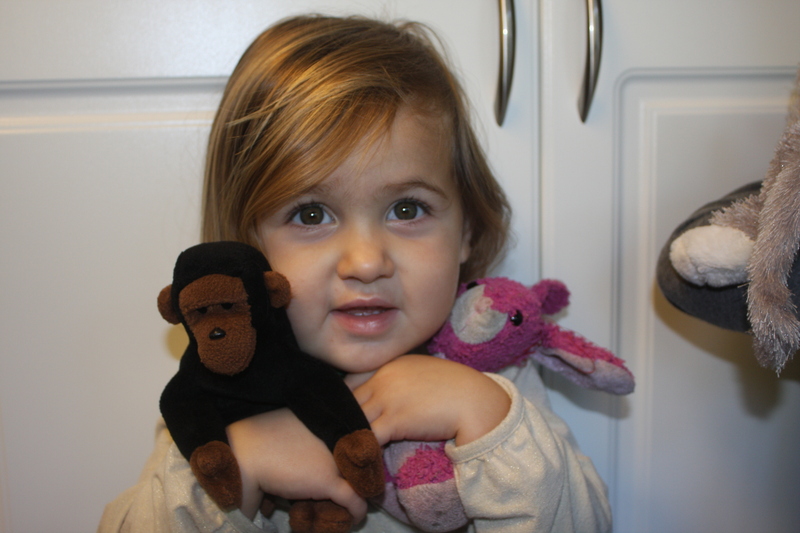 On a business trip in March 2012 two more monkeys joined Kongo’s troop. They are Cheeks and Valentine who used to live with a woman named Helen in Herndon, Virginia but were set free to join Kongo’s band and see the world. The picture below shows Cheeks, Kongo, and Valentine having drinks at the Sky Club in the Minneapolis airport. Another monkey, Sweetheart, has also been adopted by the troop so we’ve got a full barrel of monkeys going here. Frankly, the logistics of hauling around a troop of monkeys is getting more than a little onerous. We will have to see how Kongo handles his future adventures with this growing band of fun-loving chimps. Even more monkeys joined the troop on Christmas Day 2012! This is really becoming a zoo. Before retirement, Kongo used to travel over 200,000 air miles each year. Mostly he flew between San Diego and the East Coast but he often visited other sites in the Midwest, South, Southwest, and other spots across the country. He still goes overseas a few times each year. As a resident of Southern California Kongo has plenty of opportunities to have exciting adventures close to home and he frequently posts about them. Kongo loves to travel, meet new people and see new places. He strongly subscribes to the notion that the journey is as important as the destination and strives to be a traveler and not a tourist. Kongo loves to hear from other monkeys and monkey lovers. You can contact Kongo by email: s.jones92120@gmail.com or follow him on Twitter @kongomonkey. Unless a credit is associated with a photograph, all the videos, photographs, and written material are original works. Kongo is happy to allow non-commercial use of his photos. Just give credit where credit is due. If you want a photo for commercial or editorial purposes, please click the link to Dreamtime on the home page and purchase the photo you want at a very reasonable cost. Kongo is a well-traveled monkey and has been all over the world and to all continents except Antarctica. He’s visited 49 of 50 states (hang in there, North Dakota…Kongo will get to you) and has lived in California, Florida, Indiana, Ohio, Michigan, Tennessee, Rhode Island, Virginia, and Oklahoma. Getting kidnapped by a two-year old in a Sky Club at the Atlanta airport. The little monkey just reached into the bag, pulled me out and ran to his 40-something mother who said in this too high falsetto voice, “Where did you get that little monkey?” Fortunately my zoo keeper heard the commotion and was able to get me back without paying ransom. Are you serious? Monkey’s don’t get jet lagged. What is the most common reaction people have when they spot you in an airport? Does Kongo have a job? Kongo retired in the summer of 2015. He now watches grand girls, writes, and travels about taking pictures and making blog entries. He’s also a docent at the Getty Villa in Malibu, California. Oh, and he still dies a little consulting on the side. Do you ever have any problems getting through airport security? Does Kongo have a girlfriend? Yes. To keep peace with the grand girls Kongo does have an “official” girlfriend. Her name is “Rabbit” and she lives in Thousand Oaks, California with the cutest little granddaughter you can imagine. Sometimes Rabbit hides out and misses her ride back up the coast and has to be express-mailed back home! Kongo also dates Missy the Monkey (see above). What are the political affiliations of this monkey troop? Well, monkeys aren’t all that political but Kongo is definitely a democrat. Valentine, in that bright red suit, is obviously a republican. Cheeks just finished reading Atlas Shrugged for the third time so he’s a libertarian. Missy is an independent monkey. Sweetheart is undecided and confused about everything political. What is Kongo’s favorite travel destination? Where exactly does Kongo live? When not stashed in an overhead bin, Kongo’s suitcase is parked in Newbury Park, California, a suburb of Los Angeles. What kind of camera does Kongo use? Kongo got a Canon 5D MK III for his birthday in August 2014 so he shoots now with the new kit and his Canon 7D which he also loves. He has a Canon 40D as a backup body. In a pinch he will use his iPhone. So, What’s with the Wings? Kongo is a Million Mile Monkey with Delta Airlines. He was pinned by one of his favorite flight attendants, Marsha, on a cross-country trip in 2012. What is Kongo’s next big trip? There’s a Japan trip in the future. Kongo is also starting to think about National Parks. Will you answer more questions in the future? So is this the same Kongo who also plays words with friends? Thanks for commenting on the likeness between Moscow and Turnpike Lane stations. Tomorrow, I’m off to Gants Hill which is supposed to be the one most like Moscow. It’s now the time to visit London, as the Olympics are coming, and a lot of things have been rebuilt or refurbished. We were just there a few months ago! “I can’t wait to see you again Kongo love, I really miss you!” Rabbit. Amazing! Kongo reminds me a little bit of my Steggy. Great idea for a blog. A great travel blog idea! Will dip up deeper definitely. I notice Kongo hasn’t been to india yet though? As I am currently living here I must put in my two cents and encourage you to travel here! Kongo has not been to India although he sorely wants to visit. I think he would like to visit Goa, Agra, the northern part of the country, and take a train across the continent. Soon I hope. Thanks fror stopping by. Kongo you’re really awesome!!! I’m going to happily follow your next travels and posts 😀 I have a hippo, and his name is Hippo, always with me, he says hi!!!! Thanks for visiting, Roberta! And Hi back at Hippo. Great!! Can’t wait to see more. Thanks for liking my post Splish! Splash! Much easier to pack than the Big Fella (another form of ape commonly referred to as a Silver Back Gorilla in our family) though I can’t quite believe this monkey is far more traveled than me! Well, Kongo does get around and given enough time I’m sure your Silver Back will catch up. Thanks for following Kongo. We’ll try to keep you amused. Would Kongo be willing to join my platoon and serve for Queen and Country? Kongo would be honoured (see, he can spell British) to serve in your platoon. Just keep in mind that he always flies first class and doesn’t do well camping out eating beans cooked over a Sterno can. He’s more of a room service monkey. I am sure Kongo would get on fine with the other cuddlies in the platoon however I must warn you that selection is tough! You might notice in Kongo’s postings that he’s a Million Mile Monkey and has the wings to prove it. He’s a tough little simian. mmmm…. then prehaps he is better off joining the officer corps in the royal air force. Isn’t the Navy the Queen’s first service? Kongo has a nautical bent for sure. Have you ever put the whole troop of monkeys in your carry-on? I would love to see TSA go through your bag. Hey, its not a violation! The rules don’t say you can’t bring on a whole barrel of monkeys. I want to see more Kongo interviews. Do you think it’s too late to write him in as a candidate? I’m not sure what political platform Kongo might stand on. More bananas? He is more of a keen observer at this point in his life. The days for being a candidate for anything are likely in the rear view mirror although he would seriously consider a cabinet position…say Secretary of Animal Relations or something. Hey Kongo. love your blog. I travel with a small rabbit – called Wabbitt, who has his photo taken all over the place as well. Dumpy the Hippo, and Joe ( a smaller hippo) sometimes travel with him. And a new addition to the family is Lucinda the Duck – she’s set up her blog, but she hasn’t done any traveling yet! Thanks for visiting my blog. igg, you seem to be traveling with quite a menagerie! I think it’s fun and am glad you do too. Taking pictures of stuffed animals is a great way to meet people. Kongo has even made his own business cards to hand out to his new friends who want to know more about him. Thanks for visiting and I love your finch! People fell in love with him in Tanzania last year – they were queuing up to have their photo taken with him! This is so great! Thanks for finding my blog so that I can smile at yours. By the way, I’m in MN and my husband is, as we “speak” in the Delta Skyclub in Minneapolis…not too bad of a place to have to hang out – for a man or a monkey! Hi, Gretchen. I’ve spent many enjoyable times at the Sky Club in MSP. I like your blog and will continue to follow it closely. Take care! Thanks so much! I get to hang out there if I’m with my husband, but not if I’m alone or with the kids – he’s the one with the frequent flier perks. It’s very possible you two have been there at the same time! Kongo is a very cute monkey! Hello Kongo! Love your blog, have hit the “Follow” button! 🙂 I have a little travelling hedgehog but he doesn’t have his own blog like you do, really like your photos too. I’m sure he would love to! His name is Trimmin D. Hedgehog, and he says hello. Thanks for stopping by my website! I have to say this was quite a fun find. Especially so since a group of friends and I all have travel mascots that we bring around. Mine is a small turtle from Germany named Mr. Slopoke. He, unlike Kongo however, loves to photobomb pictures. =) Happy travels! Your idea for this Kongo blog is so amazing and clever. I love it. Your children/grandchildren must love it. I hope they are sharing Kongo with their classmates.Thanks for your creativity. Thanks, Harold! It is fun. I saw Kongo’s look alike on the Inca Trail this past weekend in the pocket of a large rucksack. He made it all the way to Machu Picchu! Was it Kongo or just another jet setting monkey? Well, this monkey very much envies you your South American adventure! Now for a South America update. Your blog really inspired the little monkey to get off the banana tree and do something about Machu Picchu! So next April he’s got a trip booked to go to the holy Inca site and then head off for another week or so in the Galapagos. Thanks for the inspiration! Richard is looking forward to his business meeting in Kongo’s hometown this week! I do hope he enjoys himself! On our last trip to Korea before relocating back to the States, a Korean friend of ours who owned a toy store presented our children with Papa Bear, a stuffed bear who was bigger than they were. Our flight back was quite turbulent and after hearing the pilot and co-pilot argue over whose fault all the bumps and jolts were, the co-pilot asked to borrow Papa Bear, took him to the cockpit and ordered the pilot out of his seat declaring “The Bear flies better than you!” Papa Bear doesn’t travel any more with the new flight regs, but lives at my daughter’s apartment. That is a great story, Cynthia. Thanks for following! Hi Kongo, thanks so much for swinging by my blog at http://www.midihideaways.wordpress.com and the like, I’m glad you enjoyed the post!! Greetings from the monkey-friendly Canary! And thanks a lot for checking out my blog. Will monitor your monkey business closely from now on! Thank you, Canary! I’ll be keeping an eye out for your flutterings as well. I like your eye and the perspective you approach your subjects. Deal – let’s mutually monitor our movements then! And thanks for the nice compliment. Thanks. I have given you a short look but will be back and stay longer. Thanks for visiting! Hi Kongo, I’ve nominated you for the Versatile Blogger Award! Have a lovely day! Hi Kongo, Thank you for dropping by my photographer’s blog! You have some great stuff here, and have certainly travelled a great deal more than I…Well done! Thanks, Angie. I just followed your blog. You have wonderful pictures that tell great stories! Wow. Kongo has such a complex personal and intellectual life. No wonder he goes places! Thank you for liking my post-Turbans,Veils and Jewels on Indian Highway colours.Safe travels and lots of love to you and Rabbit. You’re very welcome, Svetlana. I loved the vibrant colors you captured. I do so much want to visit India. Someday soon I hope. Thank you, Kongo, for stopping by and liking my humble travel and photography blog. I enjoyed reading of your travels and look forward to reading more about the places you’ve been and sights you’ve seen. Wow…all hail to the monkey king! Quite the poet, anelephantcant. Very clever! Thanks, Jennifer! I’ll let you in on a little secret, Kongo’s original name (printed on the Beanie Baby tag he was born with) was actually Congo with a C but I didn’t like that spelling and didn’t want to confuse everyone with the country Congo or the Congo River so taking a degree of literary license, I changed the name to Kongo with a K. I like the K better. I have “Monkeys” on my WordPress search page and check out all the monkey posts every few days. I particularly liked your. Who doesn’t like a monkey?? Thanks for visiting. Sweet K, thank you for the follow! Will you come to Sweden if I follow you to ….California – was it? Sweden may be in the cards sometime, dear lady! Monkey love …. what can I say that hasn’t already been said? What’s not to like about a traveling monkey who also blogs!? Thank you Kongo for “Liking” the post “Love Of The Canvas”. Artists Of Our World on my photography blog http://www.throughharoldslens.com. Thanks for following, Xina and many thanks for the link to the banana video! It was great. I loved it that the guy doing the banana peeling demo was actually wearing monkey pajamas! Wonderful blog. Last year I took Flat Stanley on a tour of India. Traveling with a flat companion was a great experience. Flat Stanley arrived in Virginia from a 2nd grade student in North Pole, Alaska, and he was as enchanted with our tour of India as I was. I returned Flat Stanley home with a photo record of his journey. http://novelriter.files.wordpress.com/2013/07/incredible-india2.pdf. What a great story, Marie. One of Kongo’s favorite bloggers sent along Flat Ruthie a few years ago and Kongo took her around until she got crushed even flatter in his travel bag. I hope to get to India next year. Plan to take the luxury train around on a NatGeo Photo Tour. All I have to do is find someone to tag along as Mrs. Kongo does NOT have India on her bucket list. Kongo will love India. Rajasthan is incredible. We did it all by car. A rail trip sounds wonderful. Though you shouldn’t miss the experience of traveling on Indian highways. The closest thing to an amusement park ride I’ve ever experienced. Well, stay tuned. Kongo just landed in Lima, Peru and is off for the Andes. Thanks for following! This reminds me of photos of a plushie Sailor Bebo that someone I knew back at our VOX blogging community captured in various scenes; quite a few from the old VOX neighborhood continued this idea. In the past three years since I’ve been doing this I’ve encountered several stuffed bloggers out there. When I visit places I also often see visitors taking pictures of little Gumby’s or other toys in front of famous landmarks. You’re quite welcome! I shared a link to the Vox Diaspora– hopefully it will garner you some faithful new followers. I think they’ve got a blog just for Babo but I can’t recall the URL right now. Sorry I haven’t visited your blog for a while, Kongo, but I’ve been travelling. Why, thank you very much Jaspa. As generally don’t participate in blog awards but I do appreciate the thought! Hope you’re having fun traveling. I am a frequent visitor of your blog and am jealous of your travels. The photos tell about the places you have been but unfortunately you did not photograph my place yet. Shall I wait for you with a Martini? Very dry with just a whisper of vermouth. I hope to get to your part of the world someday! Haven’t heard from you in awhile. Hope the monkey is settling in and having fun again! The monkey is doing great. Settling in, planning a remodel, and hosting a lot of visitors. Hope all is well with you. Wonderful news! There is so much to do in your area – you’ll have tons of photo ops. Enjoy! Nice to meet you here. TravelMonkey has been around for sure. Hopefully, I will visit some of the same places you have been to. Wonder if you advise not to go to certain regions at this point. Thanks so much for stopping by. There are very few places Kongo would not recommend visiting. North Korea now but maybe things will change in the near future. Some areas of Africa with tribal unrest should be deferred. Kongo wouldn’t go to Syria at the moment. But it’s a big world and there are so many great things to see that you should just pick a spot and head that way! Enjoy. Check the U.S. Embassy Website in Mexico City on places you ought to stay clear of.